The Gear Technology family of products is where the world turns for information about gears, gear manufacturing and power transmission products. We reach a broad-based audience of gear industry professionals involved with every phase in the life of gears and geared products, from conception to design, from design to manufacturing, from manufacturing to inspection, from inspection to purchase and from purchase to use. Our products are read in more than 60 countries around the world, at huge multinational corporations and small job shops, in high tech offices and on the shop floor. 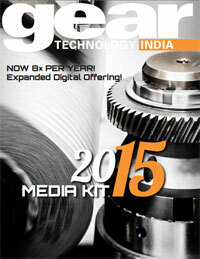 Gear Technology India provides a targeted resource that allows advertisers to reach the gear and power transmission industry in India. The Media Kit contains complete information about the magazine, including the editorial focus, the audience served and advertising rates.